Objectives: Infertility is one of the important complication in gynecology and the aimof the present study was to investigate the etiology and risk factors associated with infertility in the southern region of Iran. Material and Method: This cross-sectional study was conducted in infertility centers of Hormozgan University of Medical Science (HUMS). Totally, 250 infertile couples were included, Variables including socio-demographic, smoking and body mass index (BMI), infertility status and its characteristics (such as: type of fertility, duration and etc.) were assessed by self-administered and validated questionnaire. Data analysis was also carried out by using the SPSS version 22. Results: The most common cause of male and female infertility was varicocele (49.4%) and ovulation disorders (57.5%), respectively. There was a significant association between level of education, age of women, women's age at marriage, number of abortions, alcohol consumption, presence of an underlying disease, and body mass index (BMI) (with female factor infertility) (P<0.005). There was also a significant relationship between men’s job, addiction, smoking, and presence of an underlying disease with male factor infertility (P<0.005). 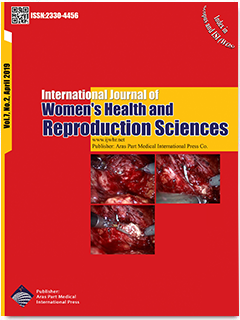 Conclusions: Considering various risk factors for infertility, an important step forward can betaken towards reducing the incidence of these risk factors by providing different education classes during pre-marriage, pre-partum, and during pregnancy and postpartum periods so as inform couples regarding controllable risk factors.